There’s a trend slowly building and it may not be good for the PC industry. I’m not speaking about tablet and smartphone growth — although that’s part of the trend — but virtualization on mobile devices. This solution allows remote PC access from a tablet, for example, and could hurt already slowing PC sales. I wouldn’t call this a new phenomenon: There have been remote access solutions on mobile devices for several years. Think of Citrix’s GoToMyPC (s ctxs) or LogMeIn’s (s logm) Ignition. These and similar services allow you to use a mobile devices to interact with the desktop of a Windows(s MSFT) PC at home, so you could work on a Word document from an Android(s GOOG) tablet, for example. But virtualization is maturing, as are the mobile chips that power smartphones and tablets. This week at CES, I played a graphic-intensive PC game with stunning visuals and fast action on an Android tablet. But the game itself was actually running on a Windows desktop. Using remote access software from Splashtop on the Asus Transformer Prime tablet, you couldn’t tell. See for yourself in the video demo I captured showing the zero-lag. Connecting a tablet or phone to remotely use your own computer is just one part of the virtualization story. OnLive has a virtualization service that lets you connect a Windows machine in the cloud. That’s not your PC, but a “PC running on the web,” so to speak. I’ve done this myself with EC2 on Amazon’s Web Services(s amzn) and it only cost me a few dollars a month to run an instance of Windows on a PC I can use, but don’t own: Far cheaper than buying, maintaining and powering a physical computer. Between this new cloud streaming of computer applications and improved remote access apps, there’s less incentive to buy a new computer. Instead, you can either get more mileage out of an old computer or “rent” one that’s available in the cloud. And either of these can now be accessed by a tablet or smartphone that’s far cheaper than a new computer. I’m not suggesting the PC industry is dead, but it is bleeding: Sales have started stagnating, and last year smartphones outsold computers, a trend that’s likely to continue, if not accelerate. In this light, it makes sense that Intel(s intc) is trying to push some smartphone activities to its new Ultrabooks. 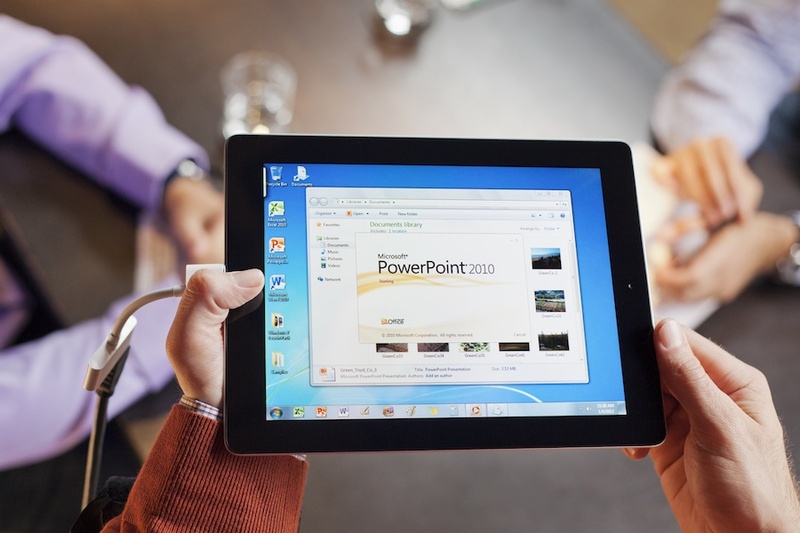 As PCs go from physical to virtual over time, consumers will have less reason to buy Intel-powered laptops and desktops, provided they have the connectivity needed to remotely access a PC from a tablet or handset. This topic is a perfect example of oxymoron. The writer himself says you are using a backend PC to virtualize it. So in short you still need a pc. the ideal point of debate is whether that PC runs as a private server at home or you are renting it from server like amazon EC. In that case PC industry might say that you still still need individual license and cannot share it across multiple user for processing. The whole article seems to be from a point of making a hype that PC’s are dead. Remember tablet and phones are still primarily an accessory. sazzad, perhaps I didn’t explain it well. The overall point wasn’t that PCs will be disappearing. Instead, it was to say that PC sales will continue to slow as we repurpose existing PCs or use virtual PC instances in the cloud. Either (or both) of these two situations will hit PC makers hard based on dramatically falling sales. Hope that helps clarify. I can see a kernel of truth in this article, but we are not that close yet for several reasons. I run Windows7 on my ipad thru Splashtop and over wifi it’s freakin amazing. I can literally run any program on my ipad (except d2d games), with my bluetooth keyboard I’ve written reports in office, etc., on my ipad. The ipad is just a thin client running from a server at this point, it’s great because you can worry less about the thin clients horsepower and storage. The caveats here are input and connectivity. Input is tough because there is no mouse support for the unjailbroken ipad yet. Windows 7 is VERY manageable with a touchscreen though (ignore the haters), I’ve even run photoshop this way, and yes you get one to one drawing, you draw on your ipad and it translates to the PC. Connectivity is tougher though, it runs like crap over 3g and there is the ever present issue of limited bandwidth plans, although I can’t see just driving your server PC as using that much data unless streaming video (which btw streaming video/audio works perfectly over wifi). But if you are on a wifi network this just works incredibly well. So personally I think this article is only partially correct. IMO we are looking at tablets as thin clients, but the question is what will the server be? Will it be your own PC at home? Will it be a PC in the cloud you pay someone like Onlive to maintain? But even thin clients will only be temporary, until the mobile OS catches up with the desktop OS. Win8 on a tablet for example will allow you the freedom to run full desktop applications on your tablet, you can still use the cloud for storage space. Worst title, without understanding the App…! I think oflate GigaOM started bashing any product from MSFT, whether it’s IE/PC/WP7/XBOX…! Kevin, you mean in the second part of the post to point the synergy between VDI and mobile virtualization. Both stand for their own, but work so well together. I surly agree. I don’t know that I agree or disagree with the end of PCs is coming, but I have to agree with Kevin’s idea of virtual and remote computing becoming big in the future. The idea of a server that my wife and son could access with tablets or a thin client type device would solve a lot of problems for me. I may give the Amazon EC2 service a look. Maybe a Windows Server in the home would work too. Thanks Kevin, you have the wheels turning in my head. Cloud computing make virtualization an inevitable outcome. cloud smartphones and Tablets are in the works!!!! Printing especially to benefit! Hmm!! Was this article written using virtual Windows? How was that? Can the author of the article give up the PC and start using iPad? Worldwide PC sales are higher in 2011 than any year before. IF I get Ultrabook with touchscreen, I will dump my opacity without second thought. I see death of tablet coming with Windows 8. That’s true for the full year: IDC estimates global growth of 1.6% for 2011 while Gartner reported 0.5 percent growth. But those aren’t stellar growth numbers and in some quarters of 2011, a decline was shown. If you think PC sales are on the upswing, you’ll have to convince me why because nothing I see shows that. – develop apps, debugging apps, design system, etc. – draw an architecture design for a building, bridge, etc. – Design and develop these mobile devices from both HW and SW. In short, the world civilization is just dying away. With all this cloud and virtualization activity I wonder when people are going to realize how much control they are giving up on thier information and computing activities. Pretty soon you won’t even be able to use your computing device without somehow “connecting” to an internet source. I am already experiencing this with my android phone. You think you are downloading an app to your phone and all it is really is an interface to some damn Google service or others. So, if you don’t have connection ability the app is worthless. I still like my PC and the control I do have concerning the use of it. I don’t know that I want some @#$# engineer telling me what I can and can not do on a computing device. Please wait patiently for your game to load while we blast you with this stupid advertisement. One thing is watching demo of remote PC access using a tablet versus actually using PC remotely. Have you tried to access using a tablet? Itâ€™s pathetic. Itâ€™s like climbing a hill for the Everest experience. Grow up, GigaOM! I wouldn’t call PC’s days numbered any time soon Kevin. High-performance notebooks are still thriving, and I don’t think Intel would be committed to Cedar Trail if they believed netbooks were a dead-end market either. Think Windows 8 on a Cedar Trail slate! I find that this is VERY premature. As long as there are games made for the PC, there will be lots of volume in PC sales. Now, if we are talking about PC’s for the workplace…then we might be on to something. But you cannot escape the necessity of the PC for entertainment value. That and until Tablets/Mobile Devices get a CD/DVD/Blu-Ray player in them…PC’s aren’t going anywhere. It’s $85/mth for a 24/7 small win instance, I wouldn’t call that “a few dollars”. $5 would buy you five 8-hour work days, that’s it. ozmark, I understand your point, but with so many online activities readily available on a tablet or a smartphone, I don’t need to use a PC 8 hours a day. I may be an outlier here, but wanted to explain my perspective. Thx! Quite a short-sited article. If the user needs a PC, they would take a PC. If they wanted just a tablet they would use a tablet. A tablet remoting to a PC is not a PC replacement – if it was then tablets running Windows 7 would have been very popular. In fact, Windows 8 essentially merges these two computing paradigms into one – making the whole hypothesis a moot point. This is the future, but for power users, content creators, scientist and IT professionals a powerful PC is still the requirement and the norm. Yup, this is the future. I tend to be ahead of the curve in some of my activities, so I’m not saying that by end of year everyone will be remotely accessing their computers or cloud instances. But I think it’s a trend worth watching. The funny thing about this is that the tablet still needs a PC (given the context of this article) even if it is a “remote” PC! Hence, the PC doesn’t die off (even if its no longer a growth market). Further hence, the PC isn’t “dead”. You still need a PC. Whether it be your own, or in the cloud, that doesn’t matter to PC manufacturers. One (or both) of you are still buying PC hardware. The article title is a complete logic fail. But if 10, 100 or a 1000 or more people are all sharing the same ‘PC in the cloud’ then that’s going to hurt PC sales dramatically! Old PCs are already sold; the PC market doesn’t care about those computers. I think it’s pretty clear I’m talking about future sales; my apologies if that wasn’t clear. @My 2 cents: Believe me, It would be Very difficult for even two users to access One cloud PC and run Skyrim. A 1:1 ratio of a PC running skyrim : Tablet playing Skyrim would be optimal. In short the PC is no where near dead. Instead, tablets are cooperative devices that work with the PC, instead of against it. Speaking of tablets, where’s my Hi-Res iPad?! A game designed to run on the iPad could be just as good as Skyrim. I hope it comes soon so I could jump back on the iPad train. Yeah, the PC is far from dead.. acting more and more perhaps as a “home network server”. Yeah, and remote access and virtualization are two different methods. not only that but to do anything with these “post-pc” devices I need a PC–what do you need when you go to root or flash a custom ROM onto these devices? A PC. How about the simple task of a complete backup? Back to a PC we go. . .
PCs will die when mobile devices are PCs. You still need a license from MS to run PC software, but you don’t need a new PC if you’re sharing a vm-based server. So, the first thing that’s likely to happen is that individuals and IT departments will figure out that it’s much more convenient to let someone else purchase and repair the hardware. Once you’re in someone datacenter you start to get access to their data and services. You could imagine those resources interleaved among the mainline PC experience… if you’ve used parallels on the Mac, it blurs the line between what’s PC and what’s Mac. And, you can (selectively) expose your data to those services instead of exclusively holding it on your desktop. Clever people can figure out how to do backups for you… generally remove the drudgery at the same time as they offer new facilities (join your data with massive cloud databases, for example). Physical device connection is the big thing that works worse, but anyone that’s done this for a while can see that being able to plug your own stuff into a computer (or flash a new rom) is a burden at the same time as it’s a benefit. And, there are other ways to accomplish that. It’s totally interesting to see the resistance to this idea. I’m guessing, it’s mostly from people who like the current model and either have some investment in it or who just don’t like change.